I’ve never really understood why colored wedding veils haven’t gone mainstream. Everyone knows that white is the tradition for both a gown and veil, but if done right a colored veil can be quite stunning! Unfortunately, we rarely see brides on the wedding blog that sport veils in hues of blue, red, or pink. It is difficult to buck the trend and just go with whatever everyone else is doing. Most real weddings and styled shoots simply feature white wedding veils and gowns. And there is nothing wrong with that. I love tradition, especially in this wonderful world of weddings. However, I also love a little bit of soft color! Maybe you never realized that a colored veil was even an option. Or perhaps you got a few blank stares from family members when you hinted that you are considering a non-white gown and veil. That’s why I am taking a few minutes to draw attention to the custom colors available here on ClassicVeils. 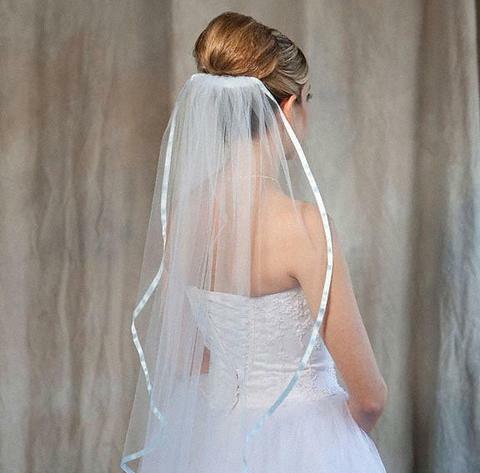 Let’s figure out if you are a bride that dares to be different by wearing a colorful wedding veil for your big day. Who knows, maybe one day colorful veils will be the norm. 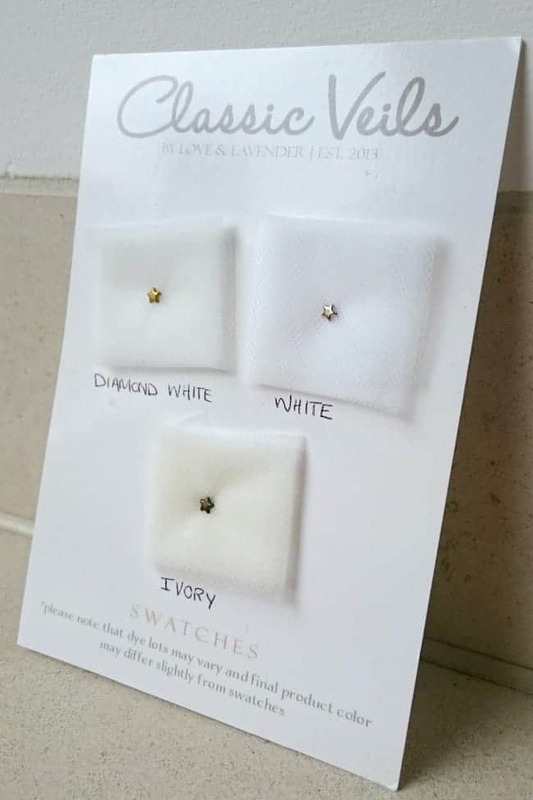 Of course, the easy answer is white. But don’t assume all white is created equal. 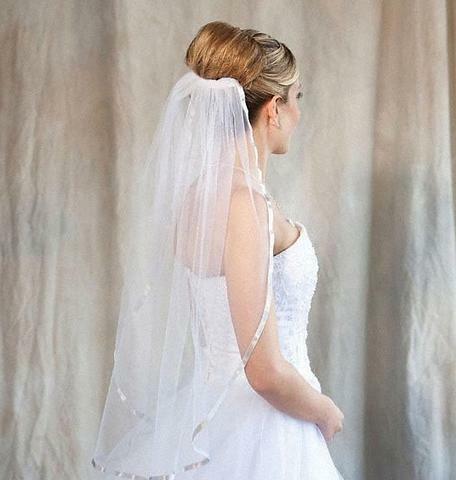 White veils actually come in several shades/tones such as ivory white or diamond white. For more information click over to my post on Wedding Veil Fabrics and Colors. Is a Colored Veil for You? For this this article, we are talking directly to the off-beat bride looking for a nontraditional veil color. Or perhaps a bride that would like to tell Queen Victoria (in her white gown) to move outta the way because you are buying a beautiful blue bridal gown and matching veil! Pink might sound bright and scary for a wedding veil color choice, but it is one of the easiest off-white colors to play with in my opinion. Time and again I see blush colored gowns hitting the runway. And I don’t think they are going anywhere. Pink is traditionally a color that represented affection and love. There is no better color to pair with a pink gown than a pink veil. How about a gown in a light shade of blue or purple? Blue wedding dresses are a beautiful alternative for the modern day bride. In fact, it used to be the tradition in Ireland that the bride wore a blue dress. 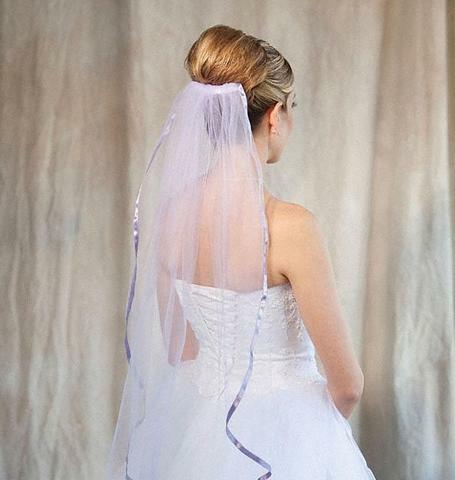 As you can see below, a lovely soft blue veil can pair well with a white gown. My favorite of the blues would have to be the light blue. I find the contrast of navy blue and white a bit too much. It is an option though for those who like it. Beige and cafe tones are more muted and won’t stand out the way a darker colored veil would. 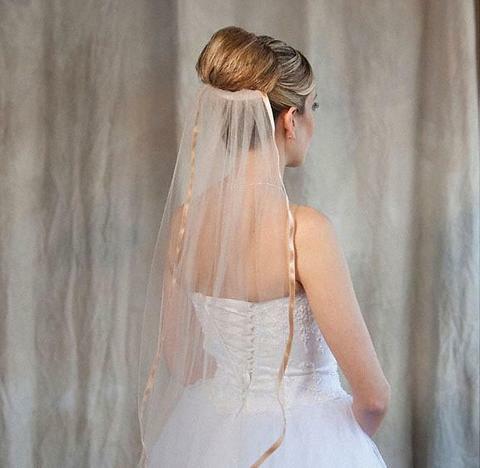 If you are blond or have light brown hair, a beige veil will blend in to give the effect of long flowing locks. A beige wedding veil is a great tone for fall weddings. They also go perfectly with matching bridal shoes or autumn colored bridal bouquets. 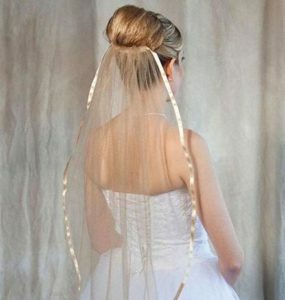 For brides seeking to add a touch of vintage glamor to their bridal look, a gold metallic wedding veil is perfect. As seen below, the golden Chantilly lace veil lends an elegant and vintage look, enhancing the more classical elements of the wedding dress. 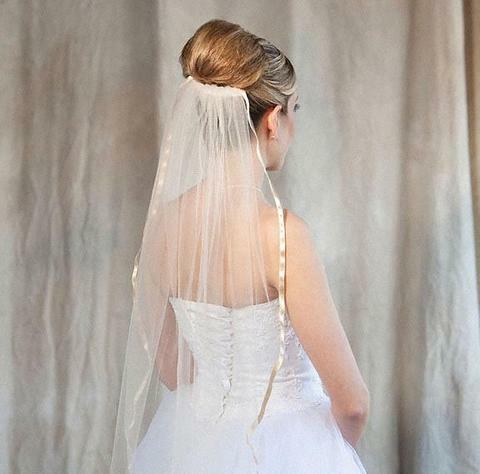 A champagne wedding veil best accompanies a light gold or beige toned wedding dress. A black colored veil is one of those colors that you are probably not looking to match to a dress. 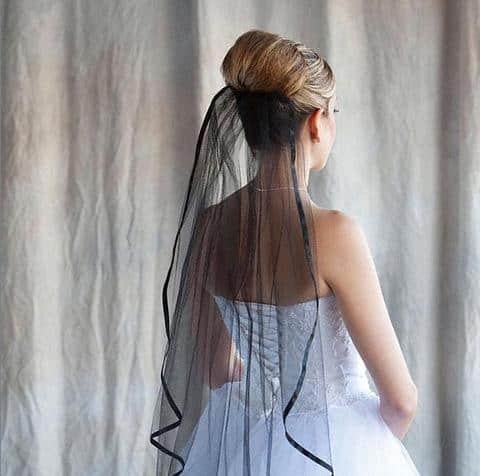 Likely, you have a specific vision in mind and need a black veil to complete the look. I think a red colored veil is in the same realm as a black colored veil – you have a specific vision in mind and need a red veil to complete the look. 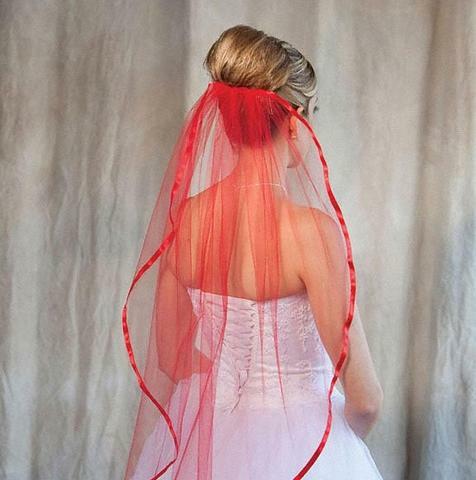 Looking at the veil below, a crisp white gown with red veil would definitely add a burst of color and pizzazz! Are colored wedding veils a new wedding trend? We sure hope so! Let us know in the comment section if you plan to wear a colored veil on your wedding day (and which color). We have over 20 colors of veiling available. Please see our custom colored bridal veil page to design your own beautiful colored wedding veil, and keep ClassicVeils on your wedding planning radar by liking us on Facebook.